Alongside the new 2018 iPhones (iPhone XS, iPhone XS Max, and iPhone XR) and the Apple Watch 4 that were officially unveiled by Apple at its Cupertino campus yesterday (September 12), the Big-A also took the veil off its latest chipset iteration — the A12 Bionic chipset. The A11 Bionic chip — that powered last year’s iPhone X — is a 10nm chipset with six cores. The A11’s performance on the iPhones it featured on utterly impressive that the A11 quickly trumped rival chipset like Qualcomm’s Snapdragon 845. And if you are an iPhone X or iPhone 8 (Plus) user, you might wonder what else your ‘super-fast’ smartphone needs. What more could Apple possibly have to offer with the new A12? First, the A12 is the first ‘actual’ 7nm chipset smartphone in the world. Although Huawei earlier announced its native Hisilicon Kirin 980 SoC as the world’s first 7nm chipset, we are yet to see a Huawei phone rocking the chipset. So Apple gets the crown, I guess. Dubbed the “smartest and most powerful chip ever in a smartphone”, the A12 is said by Apple to run faster than its predecessor, launch apps up to 30% faster on the new iPhones, and will run general phone processes 50% faster than the previous iPhones. The A12 as a chip manufactured using the 7nm fabrication node means it has a smaller node and can accommodate more components and in turn permit faster and more powerful processes and operations. The new A12 Bionic comes with a total of 6.9 billion transistors and likewise CPU (6 cores) and GPU (4 cores) configuration designed to up energy efficiency and performance on the new 2018 iPhones. There’s another separate unit called the artificial intelligence powered ‘Neural Engine’ which adopts machine learning technology for all its operation. 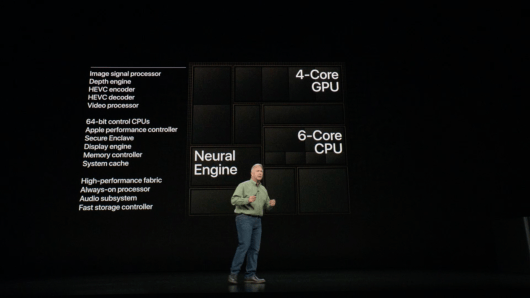 The Neural Engine debuted on the iPhone X as the unit responsible for Face ID facial recognition, Animoji, and other machine learning processes. The iPhone X Neural Engine had only 2 cores and could handle up to 600 billion operations per second. Guess how many operations per second the new A12 Bionic chipset can run — 5 trillion! Also, the A12 comes with a total of 8 cores — six more than the iPhone X’s. Apple also says the A12 has a “smart compute system” that determines which of the chipset’s unit (CPU, GPU, or Neural Engine) is best suited to execute a task/command/operation and assigns it to the best unit it seems fit. The smart system can also assign a unit to supply additional lending power where necessary. Improve camera modes and lighting for better photography and clearer FaceTime calls. The Apple A12 Bionic is one beast of a chipset — at least on paper, for now. It is, however, certain that when the newly launched iPhones officially hit the market by September 21, we’d get to witness, first-hand, how fast the chipset can get, the improvements its supposed to bring aboard, and how it compares to the A11 in terms of benchmark scores and usage experience. I trust Apple’s words though; from the A10 upwards, Apple have been doing a great job with their chipset. They sure aren’t going to disappoint with the A12.